February 26: Clients on a half day offshore found the school of tuna but were only able to get one today. February 18: Davis Jefferson Family got into the Tuna School Today getting 10 of 16 of them one really nice 70 lb. and released a Sailfish also. February 17: Gary Shangian and Marty on their first of 3 fishing Quepos started their week with Captain Rolondo aboard the MoonWalker released 4 Sailfish of 4 Raised. February 5: MoonWalker client Pistol Pete along with Natalie and Paul had a great day releasing a Blue Marlin, 5 Sailfish and 4 Mahi Mahi boy will they eat good tonight! When split charters work out for everyone! February 1: Rob Jones and Bill Newcomb release a Blue Marlin, 1 Sailfish and 11 Tuna Sashimi!!! January 27 Thomas and Thomas on their last of 7 days here fishing with us and finished out with a great day raising a Marlin got lots of dinner with 2 Mahi and 4 Tuna and confirming these same dates for 2019. Coming back to fish the MoonWalker. January 22 Thomas Langeland on Day 3 of 6 here has rebooked the same 6 days for 2019. Having another amazing day with Captain Rolondo Chaves aboard the MoonWalker going 1 for 4 on Blue Marlin, release a sailfish of 3 got a Mahi and 3 Tuna. November 20: Alan Crumpler here with his Dad and his boys spent their first of three days fishing with us got treated to how the fishery is here with the release of a Blue Marlin and 14 Mahi Mahi. Someone will be eating good with all that Mahi. November 15 Robert Wagner and his son and wife were scheduled for a half day inshore and heard that offshore was good and good it was releasing a Blue Marlin today just 8 miles offshore. November 8: Tim Perkins and his mom and dad and 2 buddies fished with Fuhgeddaboudit Sportfishing today aboard the 31’ Bertram and are going to feed everyone in their Villa tonight after getting 18 Mahi Mahi. Tim and Vicki are here for their Destination Wedding. They ended their day with a beautiful cruise aboard Fuhgeddaboudit with a Rainbow special ordered. August 21: Chris and Susan Houston releasing 3 Blue Marlin today aboard the 33' Dawson MoonWalker with Captain Rudy Solano. Wow Wow Wow while Tony Bagliore and his guest Carlos released 2 Blue Marlin and also got 3 nice Tuna! What a day! August 20: Tony, Lori, Darlene and Carlos released 4 for 5 Blue Marlin today out at the FADS! This is what we are talking about!!! August 14: Despite the big swells inshore David Debaise and his family headed offshore today and thankfully were rewarded with 3 nice Tuna before headed back in. August 12: Sam Williams went in search for a Roosterfish this morning and then offshore to get to experience the best of all the fishing options Costa Rica has to offer its anglers. August 8: Jenny and Tom Rowles today on a 3/4 day offshore on the 30’ Gamefisher got a nice mix with Sailfish, Dorado and Tuna. Nice Day! July 23: Tony and Lori Bagliore along with their crew of Fuhgeddaboudit Sportfishing headed out to the 70 mile FAD today and got a nice Grand Slam 1 Sailfish, 1 Black Marlin and 9 Blue Marlin. What a day! 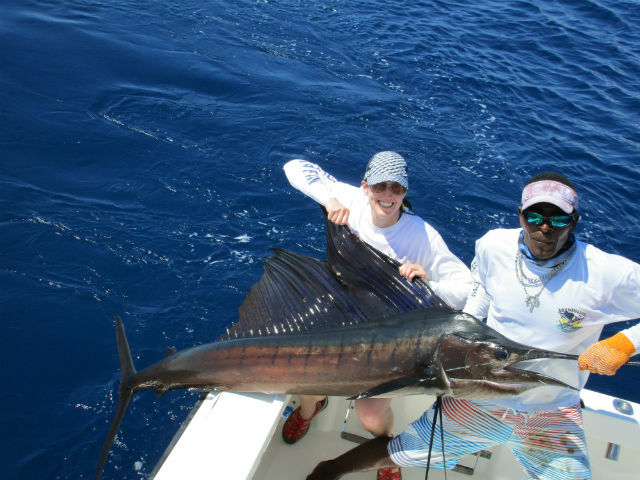 July 22: Tony and Lori Bagliore offshore today on the Fuhgeddaboudit released 5 Sailfish. July 21: Lori and Tony Bagliore on Fuhgeddaboudit released 5 Sailfish and 1 blue Marlin. Jack Kingry on a half Day inshore got 2 red snapper 1 barracuda and a shark. July 20: Randy Waller and his family fished a full day offshore staying plenty busy with the Release of 2 Sailfish, 2 YellowFin Tuna 2 Mahi Mahi and 5 Grouper. July 6: Henry Hernandez and his son Nick fishing offshore today aboard the 32’ Luhrs released 1 of 4 Sailfish and got 2 Wahoo!!! July 3: Damon Long and his family fished inshore today with the kids having lots of action getting 10 Spanish Mackeral and 1 Jack Crevalle. July 2 Austen Smith off shore today got this beautiful Dorado. Had some shots at Sailfish also. June 29: Jacob Ledbetter and his dad fished aboard the Fuhgeddaboudit Sportfishings busiest boat and crew the 33' Dawson MoonWalker today. Jacob had spoken to clients at hotel Mariposa that fished yesterday and had gone 2 for 3 on blue marlin 2 Dorado and a Sailfish so he called wanting a shot at a marlin. Well yes this is how we do it going 2 for 4 on Blue Marlin. June 26: Kimberly Holley did a bit of Offshore and inshore today getting a Sailfish on but no release but did get her Roosterfish Inshore! June 15: Michael Peters headed out to the FADS after hearing about all the Grand Slams going on at the 120 mark. So off he went on the evening of the 14th for a full day of action going 4 for 4 on Blue Marlin, Released a Sailfish and got a nice Dorado. Closer to shore Tony raised 2 Sails but no bites. June 13: Stellar day for owners of Fuhgeddaboudit with a day offshore just on the back side of the Full Moon at 35 miles got into several pods of dolphin and birds working. The tuna were jumping in every direction. Getting 11 Tuna throughout the day. Hooked into a Blue Marlin and a Sailfish at the same time. 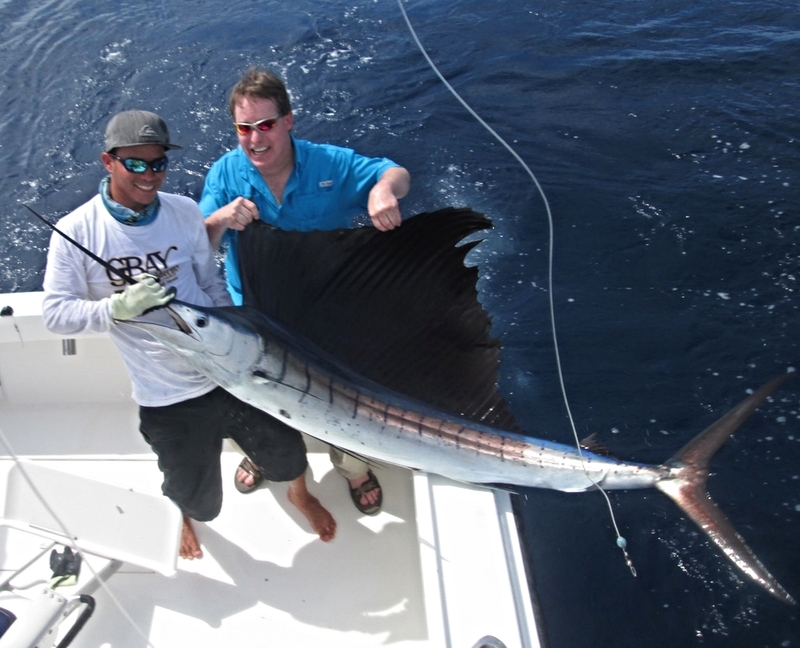 2 Sailfish released. Meanwhile aboard the 33’ MoonWalker with Captain Rudy Solano hooked into a 110 lb. Tuna that they fought almost 2 hours. They got another 3 smaller tuna and released 2 Sailfish. June 8: aboard the Queen of our Fleet the Fuhgeddaboudit with owners Tony and Lori guests Michelle and Greg scott Tilton and my self and our crew from MoonWalker had so much Tuna Fun getting 7 of them. May 16: Well Jim aboard the 33’ Dawson MoonWalker with Captain Rudy Solano had another stellar day with the release of 2 Marlin they boated 2 Mahi Mahi over 50 lbs. and got another 13 small Mahi Mahi. While James Price and his buddy fished a full day inshore with Captain Luis Carlos and wanting to do everything themselves had good luck with 2 Red Snapper, 1 Nice Roosterfish and 1 Corvina. May 9: Tim Ferguson and his family were excited to hear of the Tuna Bite and being aboard the MoonWalker today with Captain Rudy Solano of course came in with a Tuna Report. Got 3 nice tuna. They had 2 sailfish bites but not releases. They also had a Mahi Mahi behind the teasers but he didn’t want to feed. So Tuna for Dinner it is! May 3: Scott Schaefer along with 9 friends chose an offshore adventure today aboard both the 33’ Dawson and the 36’ Luhrs. With Captain Rudy Solano at the helm on the MoonWalker they were guaranteed to get the Tuna. Often the other captains joking and call him Captain Sashimi as he has been beating out the fleet with his Tuna catches!! April 24: Day 1 of the 2017 Offshore World Championship with 50 teams competing from around the world we had team 24 from Brazil aboard the MoonWalker today. Releasing 3 Sailfish of 7 bites putting the team in 11th place today. Good Luck to all the anglers here. Looking forward to the next 3 days of fishing. April 19: David and Ed Reynolds here from England on their first Offshore trip here in Costa Rica aboard the MoonWalker had a delightful day with 5 really nice Yellow Fin Tuna. Loved the hard work of the crew! April 18: Chris Haik along with his Son and his Dad headed offshore today as well. Delighted with the first release of a Sailfish early in the am they headed to the Tuna Schools and got 3 Yellow Fin Tuna in a 3/4 day returning to the marina very happy customers. April 15: After a crazy day of Tuna fishing for Tony and Lori Bagliore the day today was just as much fun. Fishing with their crew they released 2 Sailfish and got 2 more nice Tuna. April 14: With MoonWalkers Owners Tony and Lori Bagliore onboard the crew welcomed them with NEW RECORD BREAKING Day!! Dan Moran invited guest and Leanne Batten both got to partake in the amazing capabilities of the MOONWALKER Boat and her Crew. Captain Rudy Solano stated the day with putting Lori on a beautiful Dorado and lots of Bonita for the Tuna Bite that has been blessing us here most days. Arriving to the school of dolphin with lots of company offshore seeking the same, we brought in Tuna after Tuna after Tuna. A total of 16 Tuna for the Day in excess of 400 lbs of caught fish. So many blessings today. The crew got to experience the fun along with Tony and Lori. The day wound up with a beautiful Double Hook UP for our Lady Anglers!!! April 9: The Bertschs, The Scanlons, Scott, Ronny and Leanne fished offshore today on the hunt for Tuna. With overcast skies providing needed shade during these hot days in Quepos. Rudy steamed out finding some structure at about 12 miles which provided lots of live bait for the tuna bite. With a report just another 15 miles away for the bite. Captain Rudy arrived and within one minute we were hooked up with a 100+ lb. Tuna. Scott first up got it right to the boat when it broke the line with official leader release. Not to worry there were lots more opportunities for the group. Getting a total of 4 nice tuna between 60-100 lbs. Lots of Dinner will be the reward. On the return we were treated with the Breach of a Humpback Whale. April 3: Derek and Heidi Slovak for a full day offshore today on the hunt for tuna got 6 of them and released a Sailfish as well. CINDY BAKER BOATED A NICE ROOSTERFISH DOING SOME INSHORE FISHING ON FEBRUARAY 8. Dec 2016 - Moonwalker had another great day of fishing: Marlin Doubleheaderthat broke the lines, three sailfish, five tuna in the 20lb. range and two dorado! kenny from the Moonwalker teaming up with captain ron on the fish whistle were able to put ted willis and norm on this catch-of-a-lifetime wahoo! great job by ted landing the fish! Doug gets a nice one! December 21 - Steve Baker had a great day offshore with the crew of the MoonWalker most importantly catching dinner 2 Mahi Mahi and also released a Sailfish. Despite the new moon the fishing was a polar opposite on the full moon this month. December 22 - Cindy Taylor despite a mechanical issue which shortened their day still released a Sailfish first thing followed by 5 sharks, so exciting! December 29- Today on MoonWalker Ron Cassada group fishing on the MoonWalker all returned quite excited with the Release of 3 Sailfish and a great release of a 250 lb. Blue Marlin to finish out the day.